In an exclusive interview with RBTH, the President of the Russian Union of Industrialists and Entrepreneurs, a powerful lobby group, speaks about Russia's investment climate, foreign partnerships and the candidacy of Dmitry Medvedev for president. Speaking as president of an organization that includes many leading Russian businessmen in its ranks, how would you assess the investment and business climate in Russia? Our union is currently preparing a detailed report on this subject; I'll provide a few key figures. As of September 2007, accumulated foreign investments in the Russian economy totaled $197.8 billion, 52.2% more than in the same period of the previous year. In other words, foreign investors are interested in Russia. The lion's share of investments in January-September 2007 came from the UK, Holland, Cyprus, Luxembourg, Switzerland, Ireland, France, Germany and the U.S. Together, these countries accounted for 85.5% of the total accumulated foreign investments and 84.4% of direct investments. Equally important is that fact that, over January-September 2007, there was $87.9 billion worth of new foreign investment activity, which is 150% more than in the analogous months of 2006. Our optimistic outlook is enhanced by the fact that Russians are now beginning to understand that they must compete for foreign direct investment (FDI) with other developing economies, such as Brazil, India and China. The federal government has also recognized this: FDI was discussed at a recent high-level meeting between the President, Prime Minister and the governors of Russia's regions. They decided to form a state structure responsible for attracting FDI, similar to the "investment agencies" that exist in many other countries. Our Union will take part in the formation and operation of the new organization, and we believe that it can play a critical role in reorienting Russia's economy away from raw materials exports. What are some problems faced by Western businesspeople who decide to invest in the Russian economy? Who supports these investors in their relations with authorities? Who is responsible for protecting their rights? Under the law, foreign investors in Russia have the same rights and obligations as Russian ones. The only problem they face is connected with the country of origin of their capital, which is sometimes restricted. Other than that there are no differences between a Russian and a foreign company. They have similar problems at the national level (VAT refunds, mismanagement, corruption, etc.) and at the regional level (attempts to offer preferential treatment to local businesses and complicated formalities in securing the use of land). Foreign companies are free to use the recently created instruments of public-private partnership: to sign concession agreements, borrow from the Investment Fund and to locate their facilities in recently created "special economic zones." There are also organizations in Russia that support foreign investors. Our union took a leading role in their formation. I would recommend the following NGOs: the National Association of Investment and Development Agencies (NAAIR), the National Agency of Direct Investments (NAPI) and the RUIE Investment Policy and PPP (Public-Private Partnership) Committee. They have all been created for the purpose of providing support to foreign investors and have extensive experience working with multinational corporations. For example, this year they've helped companies like PepsiCo and SAB Miller expand into regional Russian markets. Do you foresee any dramatic changes facing Russian businesses after the upcoming presidential election? Yes. I think investment policy will become much more efficient. We believe that Dmitry Medvedev's nomination is good for business - he is the most liberal and market-minded of all the potential candidates who have been mentioned in recent years. His candidacy will finally improve the dialogue between business and the state on the high level of government interference in the economy, which will be good for Russia's image and for the overall investment climate. Born on December 25, 1951, Alexander Shokhin is currently the Chairman and President of the influential Russian Union of Industrialists and Entrepreneurs (since 2004 and 2005, respectively), and the Chairman of the Supervisory Board of Renaissance Capital Investment (since 2002). He graduated from the Economics Department of Moscow State University in 1974. Shokin is a Doctor of Economics, a professor and a member of both the Russian Academy of Natural Sciences and the Public Chamber of Russia. In the years 1991-1994, he held various posts in the Russian government, including the Deputy Prime Minister, the Minister of the Economy and the Minister of Work and Employment. 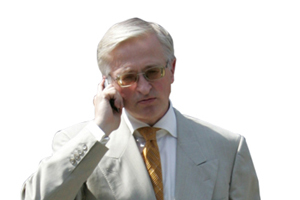 Shokhin was subsequently elected to the Russian State Duma (parliament), where he served as an MP from 1994 to 2002.